Polished metal divot tool with magnetic 1.00" diameter ball marker. Combining patented design and superior magnetic technology, the Tour Series has no equal. 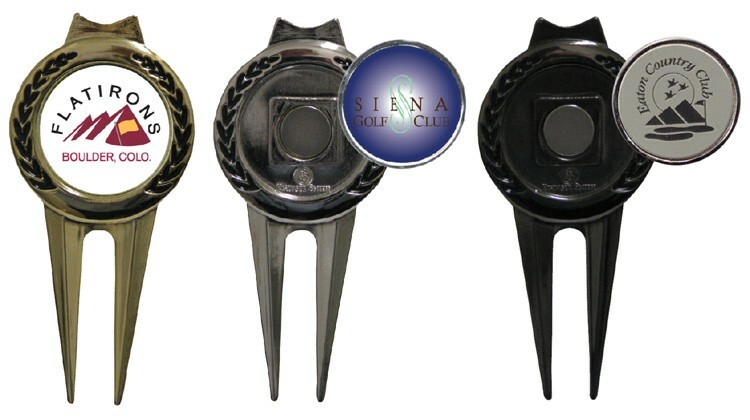 Customize with club or event full color domed or satin etch imprint logo. Polished gold, polished silver, or polished nickel black finish. Frosted etch - add $ .50 per piece. 2.75" x 1.375" x .125"
• Polished: Gold, Silver or Nickel Black.